This contest is how this sandwich came about. Tillamook is made right here in Oregon, and I love using local products as much as possible, so I knew this would be a fun contest for sure! This is Tillamook’s 4th annual grilled cheese contest. The rules are pretty simple, create your own grilled cheese using their cheese and submit your recipe. The contest ended yesterday, and now I’m anxiously waiting a reply to see if my tasty sandwich will be in the final judging! I knew pear and prosciutto pairs really well together, and usually with some brie, but since Tillamook does not make a brie, I had to try something else. Tillamook medium white cheddar was a perfect stand in! Mild enough to not over power the other components, yet enough flavor to stand out just a bit. The arugula is there because I just love arugula on my sandwiches and grilled pizzas! And I needed another flavor, a spread…not the usual butter…a fig spread! 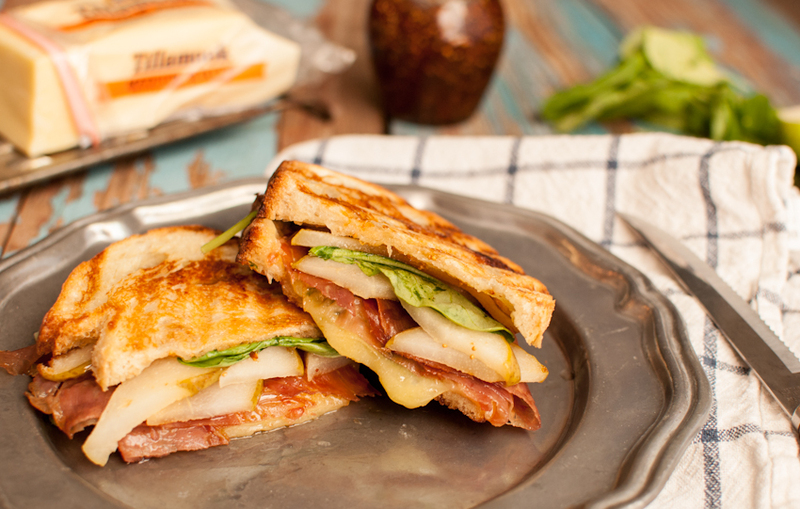 A little goes a long way….it’s the perfect sweetness to add to the saltiness of the cheese and prosciutto. 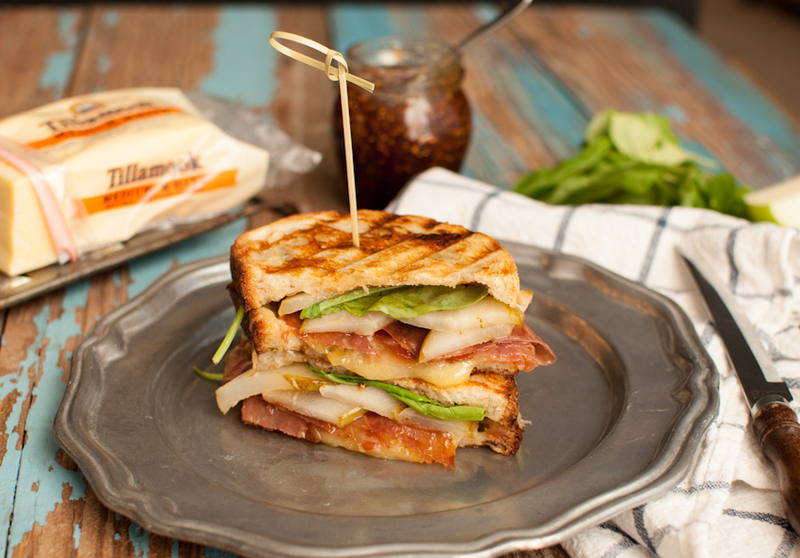 So, in the meantime, pick up these ingredients, make yourself a salty, sweet, cheesy sandwich and check back here in a few weeks to see if this sandwich made the cook off….or better yet, wins! In a small skillet over medium heat, melt the butter. Add the pears, saute each side for about 2 minutes until lightly brown. Remove from pan. Add the prosciutto to the same pan, saute for 30 seconds each side. Remove from pan. Spread 1/2 tbsp of the fig spread on each half of the bread. Top one side of the bread with the pears, prosciutto, cheese, and then arugula. Place the other half of the bread, fig side down. Heat a panini press or foreman grill to medium high heat. Spray the outside of the bread with olive oil spray. Place sandwich inside press and grill for 2 minutes. Cut in half and serve, makes 1 tasty sandwich! Grilled Cheese sandwiches are the best! 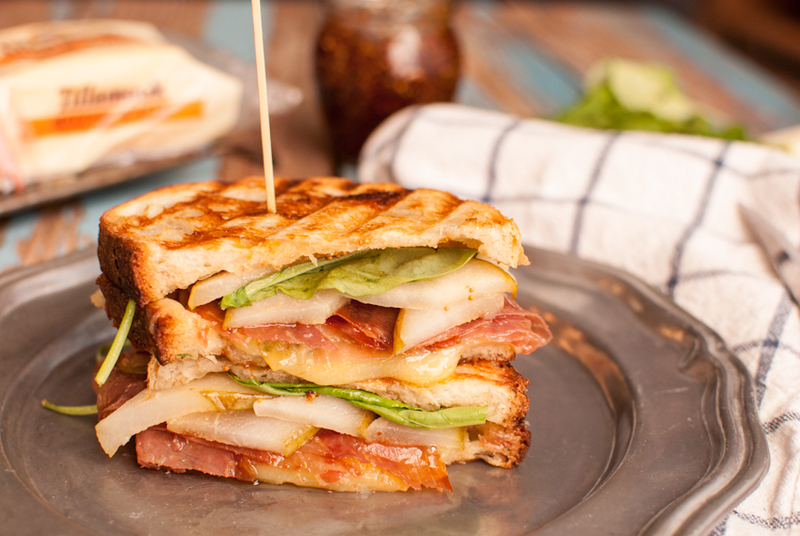 (Well, BLT’s are the very best- but grilled cheese is a close second.) this looks delicious.